Here's 40 movies that were actually made better thanks to studio interference. Whether it was the studio pushing for the perfect casting (Fight Club), or making sure that a rewrite was done by the right person (Dredd), we have the studios to thank for these great movies. The Studio Interference: For a start, it was the studio that sought out Pitt and bagged him for the film. Meanwhile, a hyper-violent scene in which the narrator beats another club member to a pulp out of jealousy was re-cut to focus more on the narrator’s face. The result is arguably more unsettling than was what scripted. If They Hadn’t Stepped In: We’d have a far more graphically violent, but arguably less disturbing scene. The Studio Interference: A rare example of studio casting requests actually going right, this one. Universal requested that Michael Gross (from Family Ties) be drafted in to play Burt Gummer in Tremors, a prospect that made the production crew uneasy. When Gummer auditioned though, he nailed the role. If They Hadn’t Stepped In: Gummer wouldn’t have ever been considered for the role, which would’ve been a travesty given how awesome he is in the film. Hurrah to Universal. The Studio Interference: Executives stepped in when the original Wizard of Oz script depicted the land of Oz as a real place visited by Dorothy. Believing that audiences were too smart to buy Oz as a real Earth-bound location, they suggested the ending be changed so that Dorothy wakes up from a horrible dream. If They Hadn’t Stepped In: If the original script had been shot, the film still would have been a masterpiece, but the addition of the dream angle affords the film an even more queasy and fantastical feeling. The Studio Interference: Branded an “unorthodox collaboration” by director Pete Travis and writer Alex Garland, the task of editing Dredd went to Garland, with reports of Travis being locked out of the editing room. 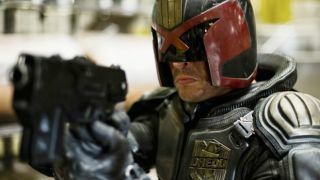 If They Hadn’t Stepped In: According to insider gossip, Travis’ cut of the film was far less action-packed, which explains why executives stepped in and handed editing reigns to Garland – what’s a Dredd film without action, eh? The Studio Interference: The opening stinger is arguably the most important part of any Scream film, and with this fourth entry, the Weinsteins wanted to make sure they had it exactly right. Which is why part of the scene was reshot to include a franchise-nodding doggy-flap death and some additional cracker-jacker dialogue. Luckily, director Wes Craven approved. If They Hadn’t Stepped In: The opening sequence would have been a lot shorter and, arguably, a lot less effective. The Studio Interference: During production on this ninth big screen Star Trek adventure, Paramount executives attempted to fix problems they had noticed with the script – including glaring plot holes – by sending a note to the film’s production team. Sadly, their advice wasn’t heeded. If They Hadn’t Stepped In: It wouldn’t have made any difference, really, considering all the attention their comments were given. Shame, they could’ve saved this most-panned of Trek films. The Studio Interference: Studio execs stepped in to prevent directors Eric Bress and J. Mackye Gruber using their original ending on this time-hopping thriller, instead tacking on something a little more hopeful and in keeping with the rest of the film. If They Hadn’t Stepped In: Bress and Gruber’s original ending – which you can see on their director’s cut – sees hero Evan Treborn (Ashton Kutcher) time-jumping back into his mother’s womb. Though we love the concept, there’s no doubt the theatrical ending is more audience-pleasing. The Studio Interference: After the success of the first Back To The Future, director Robert Zemeckis was told by Universal Studios that they would be making a sequel with or without his help. Thankfully, Zemeckis decided it was best if he continued the series himself. If They Hadn’t Stepped In: We wouldn’t have gotten sequels at all, which, in light of how much fun both Parts II and III are, would be a real shame. Thank goodness Universal had wherewithal enough to hire Zemeckis, though. The Studio Interference: Director Richard Donner was infamously fired by producer Alexander Salkind on his Superman follow-up. The reason? Donner was letting the budget get away from him, making for a tortured production process that was bound for a meltdown. If They Hadn’t Stepped In: Arguably, Salkind stepping in stopped the film from devolving into a massive mess. And even if you prefer Donner's recent director's cut, the Superman II released in cinemas was far from a disaster. The Studio Interference: Executives took matters into their own hands regarding just one detail in The Matrix. In the Wachowskis’ original script, 'the Matrix' is a massive neural network computer that humans are hooked up to. Believing this idea was too difficult to understand, execs insisted that it was changed. Instead, we’re told that humans are being used to generate electricity. If They Hadn’t Stepped In: The Wachowskis’ explanation would’ve been more sound on a scientific level, but definitely would’ve left most of us scratching our heads. And as we learned from the sequels, the more complex The Matrix got, the more our enjoyment levels suffered.